Interior of the roof support structure. The bell-shaped roof of this structure is very unique for a barn construction. Eight laminated ribs provide the main support for this structure. 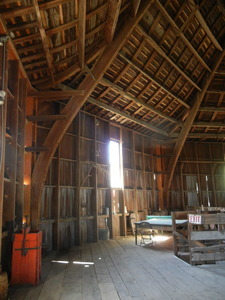 The beams connect all the way up to the barn’s cupola in the center. Built in 1883. Restored by Rich Tyler. McCray, Linzee Kull, “Secrest Octagonal Barn, 2012,” Iowa City Public Library, accessed April 23, 2019, http://history.icpl.org/items/show/674.